Good Afternoon fellow parishioners and distinguished guests. For those of you who may not know me, my name is Jimmy Dunne and I am chairperson of the 150 Jubilee Celebration Committee. You are all very welcome and thank you for coming out to-day in such large numbers for the official launch of our sesquicentennial church celebrations. I extend a special welcome to our invited guests, some of whom have travelled long distances to be with us here to day. I particularly welcome back to his home town our guest of honour, Mr Ronnie Delaney and his wife Joan . In 1956 he captured the hearts and minds of a nation and the world when he won the gold medal for the 1500 meters in the Olympic Games in Melbourne, Australia. It was the start of a journey that would immerse him into the public arena and one that would see him achieve great honours as the years rolled by. He was conferred with an Honorary Doctorate of Law from University College Dublin. 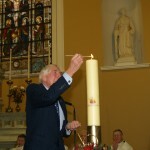 He is a former chairperson of the Irish Sports Council, and current Chairperson of the Irish Olympians Association, a Freeman of the City of Dublin, a successful business person –the list goes on and on. But the most notable aspect of that journey is that he never lost sight of his roots and his contribution to so many communities, organisations and associations throughout Ireland is truly outstanding. We are proud and honoured that he accepted our invitation to open our 150th Jubilee celebration which will take place after the Gospel of this mass. The procession you have just witnessed comprised many of the groups that are central to the everyday life of our Parish. They carried 15 candles one for each decade since our church was blessed and opened. They, along with other groups and organisations in the town will be participating in other events during the year, just like our choirs that have rendered such beautiful singing for the entrance hymn. We look forward to hearing many more renditions from them during the next twelve months. During the past year our Jubilee committee, along with many of our other church committees have been working hard to organise events to commemorate this very special year in the history and life of our Parish. Preparing for the 150th anniversary of the opening and blessing of our Church provided the focus for many occasions of celebration during the next twelve months. It is an invitation to all our community to become involved as we retrace our history strengthen our Faith and build for the future. It is also an opportunity for all of us to celebrate, to reflect upon and to renew the rich legacy of the Church of Sts Mary and Peter. To-day we commence our celebrations to honour our forefathers, the builders of this great Church -the same people who displayed such spirit of determination and courage in those bleak and challenge days of 1861. On Wednesday 29th September 1858 the foundation stone was laid. In January of 1859 the then Parish Priest, Fr Redmond, sent out a circular to all parishioners seeking support and in August 1861the Church was officially blessed and opened. It was a remarkable achievement when we consider that a few years previously; the famine of 1847 had ravished our country. Like our fishermen, to-day we cast the net out and begin our journey of celebration. We encourage all our community to take part and feel involved, and invite all our former parishioners who have moved from the town to return and join us for our special immigrant celebrations in the first weekend in July. Our forefathers, when they commenced on their journey did not think that their lives were of any moment but now they are of course, and our celebrations and contributions are the history we will leave for future generations. Na Lagaidh Dia sibh go leir is bainigi taitneamh as an bliann speisialta seo.